An example of some aspects of my food consulting work: a recipe that I have created, cooked, styled and photographed. Text and photo © Christopher Tan. Reproduction or use without permission is strictly forbidden. 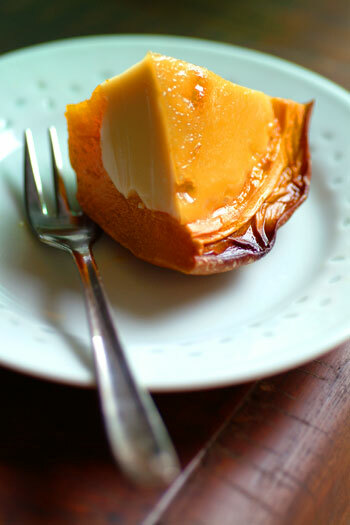 My adaptation of the traditional Thai dessert fak thong sankaya, coconut custard steamed in a whole hollowed-out pumpkin. I prefer to halve the pumpkin and steam-bake it instead, so that the custard ends up with a slightly caramelised top. 1) Preheat oven to 160 degrees C/ 320 degrees F. Set a cake tin filled with hot water on the bottom shelf. 2) Halve pumpkin horizontally. Scrape out seeds and fibres with a sharp-edged spoon, leaving walls about 2 cm thick. Place pumpkin halves in a roasting tin: if necessary, trim their undersides so that they sit firmly, without rocking. 3) Combine coconut milk, palm sugar and salt in a non-stick saucepan. Stir over medium heat until very hot and sugar has dissolved. Taste it: it should be just very slightly too sweet. 4) Combine eggs and egg yolk in a mixing bowl. Pour in hot coconut milk gradually, whisking constantly just until smooth. Strain mixture into pumpkin halves, filling them to the brim.